You can create a Discount Code for your users to be applied to their registration fees. If you offer a board member or coaching discount for any amount or percent off, using a discount code is a good use. Provide the discount code to applicable registrants BEFORE they proceed through the online registration session. 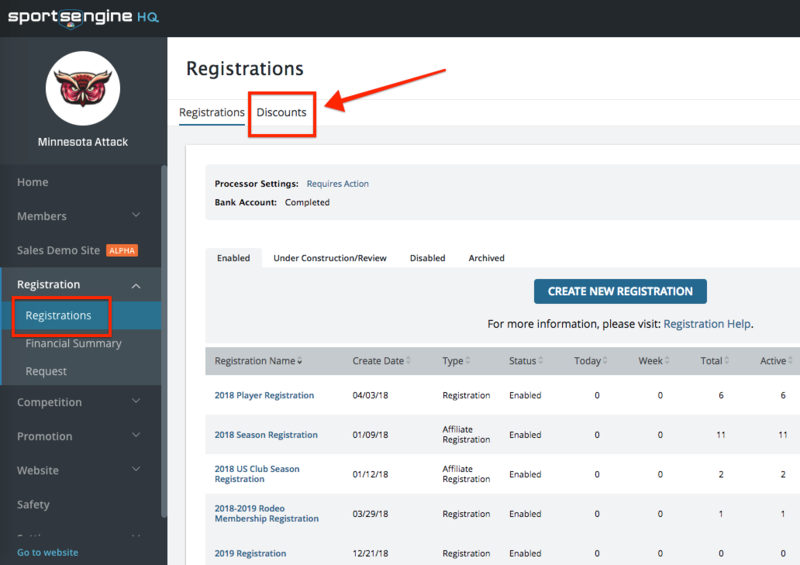 Users will go through the online registration process as any general registrant would, however when they come to the Shopping Cart Page of the registration session, they will enter the discount code and hit "Apply" to see the original registration amount crossed out and the new discounted amount reflected. If a user is registering multiple family members and the discount is only applicable to one family member - please instruct the user to register the user completely separately (all the way to through the Review, Shopping Cart, Checkout to the Receipt Page) from all other family members. This will ensure that the discount code will only apply to the one player's registration fees vs. all of the family member's registration fees. Who Can Create Discount Codes? You need to be a Webmaster to create a discount code. Discount codes are located in the HQ > Registration > Discounts tab. Step 2: Click on the Registration tab, then choose Registrations. Step 3: Select the Discount subtab. There are two types of discount codes you can create: Single Use or Multi-Use. Multi-Use: A multiple use code means one code can be used by more than one person. You can create this code to be whatever you want. Single Use: A single-use code means that a system generated code can only be used once per order. The system generates the codes automatically, then you would provide those codes to your registrants. You can generate multiple single-use discount codes at once. You would provide the code to a user and once it was used it becomes unavailable to use again. Note: Discount Codes are NOT case sensitive. What Percentage or Dollar Amount off? Discount codes can be built to discount in any percentage off of a store item or any dollar amount off. You can create codes with various percentages or dollar amounts off. What Items can I discount? You can select items in your registration to which this discount code will be applied. Select the item(s) in the list of available registration items or you can choose Select All or Deselect All. You can find each multi-use code and the applicable usage of it by clicking on the Registration Tab from the Admin Control Panel, then selecting the specific Registration Session Name of the Registration in which the discount code(s) is/are applicable. Note: You can only view Multiple Use codes here, not single-use codes. Always save single-use codes when you receive them.